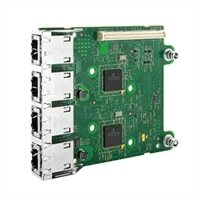 Dell Quad Port 1 Gigabit Broadcom 5720 Network Daughter Card, CusKit The BCM5720 is a fully integrated 10/100/1000BASE-T Gigabit Ethernet media access control and physical layer transceiver solution for high-performance network applications. The Quad-Port Gigabit Network Daughter Card features quad triple-speed IEEE 802.3-compliant Media Access Controllers (MACs) with quad 10/100/1000 Ethernet transceivers (PHYs), PCI Express bus interface, and on-chip memory buffer in a single device. It's based on dual BCM5720 Controllers each providing two ports. The BCM5720 is a fully integrated 10/100/1000BASE-T Gigabit Ethernet media access control and physical layer transceiver solution for high-performance network applications. The Quad-Port Gigabit Network Daughter Card features quad triple-speed IEEE 802.3-compliant Media Access Controllers (MACs) with quad 10/100/1000 Ethernet transceivers (PHYs), PCI Express bus interface, and on-chip memory buffer in a single device. It's based on dual BCM5720 Controllers each providing two ports.